Join Lisa Hawkeswood and friends, at this very first tribute show that Lisa has put together to honour the late Amy Winehouse, who was an English pop-soul singer and who had enormous musical talent, coupled with a drug and alcohol problem at times. 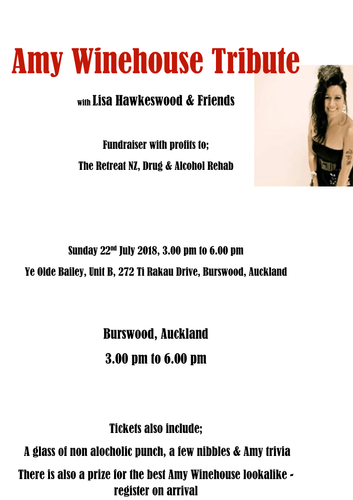 This event is a fundraiser for "The Retreat NZ, Drug and Alcohol Rehabilitation" unit in Otahuhu, Auckland, who are a not for profit organisation who do fabulous work supporting people with giving up the booze, and they could do with a little financial support to provide outdoor furniture for the residents to use, while on their stay there. So please come along to this show and enjoy an eclectic mix of various musical genres including jazz, rock 'n' roll, rhythm and blues and ska with songs such as Addicted, All My Loving, Back to Black, Cupid, Fly Me To the Moon, Half Time, Hey Little Rich Girl, Me and Mr Jones, Monkey Man, Our Day Will Come, Rehab, The Girl From Ipanema, You Know I'm No Good, Valerie plus tribute songs from Adele and Christina Aguilera’s repertoire, plus many more. Prize for the best dressed Amy.